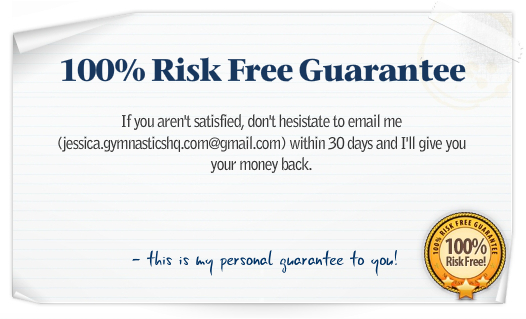 Does your child want to be a gymnast and you don’t know what to do next? Do you want to learn how to help your child progress faster? Do you want to learn what it takes to help your child succeed in gymnastics? Is your daughter on the gymnastics team but you’re still confused? Do you need some tips for choosing a gymnastics gym? Do you want a complete guide to gymnastics for parents with all the information you need and want to know? Pick the best gym for your gymnast by knowing exactly what to look for. Know what to expect on your child’s first day of class. Be the “informed parent” in the stands at gymnastic meets. Find out how routines are scored. Learn what to bring & tips to make your gymnastics meet experience successful. 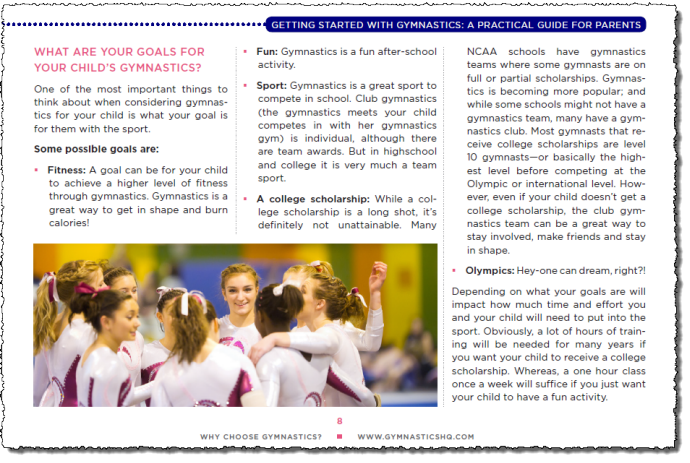 You will be getting a 32 page complete ebook guide for getting your child started with gymnastics. 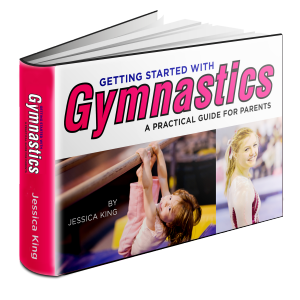 I wrote this ebook because I know that gymnastics can be confusing.It can be especially confusing for new parents just getting involved, with no background in the sport. Over the years I’ve been involved with gymnastics from many different perspectives. My intent is to put together a comprehensive resource of all the information you would need or want to know, whether you are looking to enroll your child in a recreational program or if your gymnast has just been asked to join the competitive team. And I hope I have succeeded!